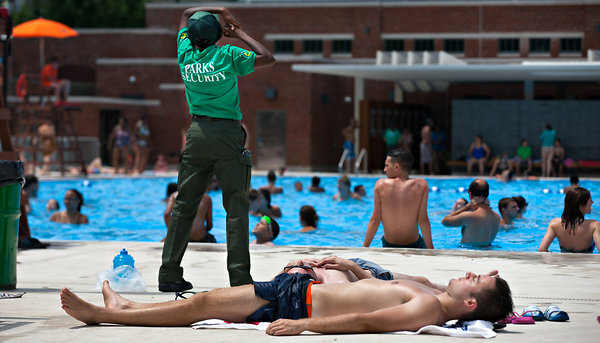 After several arrests and fights at the McCarren Park Pool in Brooklyn, a simple kickoff to summer in New York City has turned fraught. When McCarren Park Pool reopened in Brooklyn last week after 28 years, it was hailed as a grand civic achievement and, perhaps, a milestone for a new social dynamic in New York City, one in which people of different racial, ethnic and class backgrounds could socialize — or at least pursue the same activity — together. A place where the children of hipster artists, attracted by the upscale restoration with its designer flourishes, would play Marco Polo with youngsters from public housing. Within days, that excitement has been replaced by apprehension. Two fights at the pool on the Greenpoint-Williamsburg border and several arrests confirmed the fears of some residents that the pool, with a capacity of 1,500, might draw an unruly crowd to a neighborhood divided among older residents of Italian and Polish descent, gentrifying newcomers and Hispanic families. What should have been a simple kickoff to summer in New York has turned fraught, with capacity crowds, racially charged debates and complaints that the city should have committed more resources to the opening, from sanitation to security. Hot weather and the pool’s reopening generated so much interest that by Friday, a day after its opening, the place was reaching its capacity early in the day. With a line of hundreds snaking around the block on the weekend, the crowd outside grew restless. Nearby merchants complained that pool visitors tossed litter on the ground, tagged buildings with graffiti and relieved themselves in public. Inside the pool on Friday, teenagers scuffled with a lifeguard who had ordered them to stop doing back flips, and the pool closed an hour early. On Monday, two police officers were injured by swimmers who also persisted in doing back flips. Three men were arrested and charged with assault in the second degree, inciting to riot, criminal nuisance and menacing. More security has been apparent in recent days. Meredith Chesney, owner of Mousey Brown beauty salon near the pool, said she came out on Saturday morning to discover three new markings of graffiti on her roll-down security gate. The McCarren pool, which holds almost 1.1 million gallons of water, is one of the biggest in the city and has a complicated history. It opened along with 10 others in 1936 in the depths of the Depression with Works Progress Administration money, under the auspices of Mayor Fiorello H. La Guardia and the parks commissioner and master builder Robert Moses. After sliding into disrepair, McCarren was shuttered in 1984. While the other 1936 pools were all renovated, McCarren remained closed, its reopening delayed not only by a lack of money, but also by a debate over its future. Some preservationists lobbied for a full-scale restoration, while neighborhood activists demanded its demolition, in part to prevent outsiders from using it. Some of the blog posts and comments in recent days have echoed the racially tinged dialogue of the 1980s, with neighbors of the pool blaming teenagers from outside the community. In fact, two of the men arrested came from a public housing complex, the Marcy Houses, on the border of Williamsburg and Bedford-Stuyvesant. The other lives across the street from the pool. The area around the pool has changed significantly in the past few years. Census data show that both the Williamsburg and Greenpoint neighborhoods have had an influx of white residents in the past decade. For example, in Williamsburg, which has attracted waves of artists in recent years, the non-Hispanic white population increased by 24,000 from 2000 to 2010, while the Hispanic population fell by 10,000. Hispanics now make up 33 percent of the 111,000 residents, with blacks at 6 percent. Some of the pressure on McCarren reflects the fact that some neighboring communities, like Bushwick, do not have large outdoor pools. On Tuesday, a number of visitors to McCarren were from Bushwick, waiting in a long line after the pool filled to capacity. “Just because you come from another neighborhood or another borough or the other side of Brooklyn doesn’t mean you’re the one causing trouble,” said Luis Morales, 42, of Bushwick. “It has to do with a few individuals who are spoiling it for everybody. The city’s parks department defended the pool’s first week. Still, the problems at McCarren have prompted the New York Police Department to put plainclothes officers at the site, and one of the police’s “temporary headquarters vehicles” is parked nearby. Alexander D. Garvin, a professor of urban planning and management at the Yale School of Architecture and the author of “Public Parks: The Key to Livable Communities,” credited the public pools with providing a crucial outlet for all New Yorkers. He added: “People say that in those days residents lived in tenements and they were crowded and that the pools were an extraordinary release in the hot summer. But guess what? The summer of 2012 is a hot summer, and we have immigrants living several families to one apartment because there is not adequate housing.